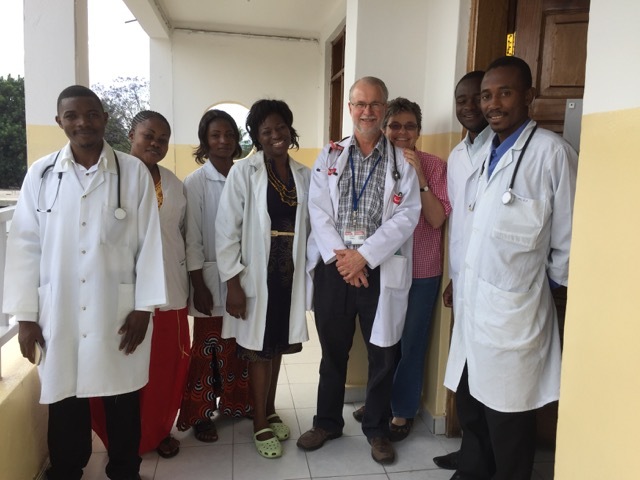 This has been the first week for Dr Neil and Gwen Wetzig on their 3-month visit to HEAL Africa Hospital without other AusHEAL members in-country. Paul and Shannan Bakes left Goma for Australia on Monday. The pace of the hospital however remains the same without the teams. 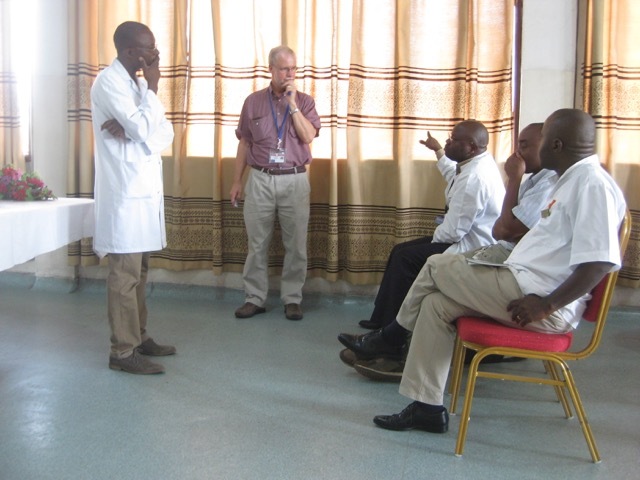 So what does a day or week in the life of HEAL Africa Hospital involve? One never knows what to expect each day. Read on! Because Neil is a general surgeon the report below particularly involves the Department of Surgery, however similar programmes occur for all departments in the hospital. Morning brings a staff ‘handover meeting’ at 8am. Obstetrics & Gynaecology, General Surgery and Orthopaedics meet together while Internal Medicine and Paediatric departments meet in a separate room. Medical students and interns present cases admitted over the weekend as well as reporting on the status of other Inpatients, particularly those in Intensive Care. The interns are ‘grilled’ by more senior staff. a male who has had surgery for a perforated ulcer. Then the team moves to the operating theatre. Surgery starts about 9.30am and continues until 3pm. Today a feeding tube is inserted into a 9 year old child with a narrowed oesophagus (swallowing tube) scarred and virtually blocked due to accidently drinking caustic soda. An attempt is made to stretch her oesophagus. She is badly malnourished and will probably need major surgery next year when Dr Neil is back in Goma in March. For a successful outcome her nutritional condition needs to greatly improve before embarking on such major surgery. 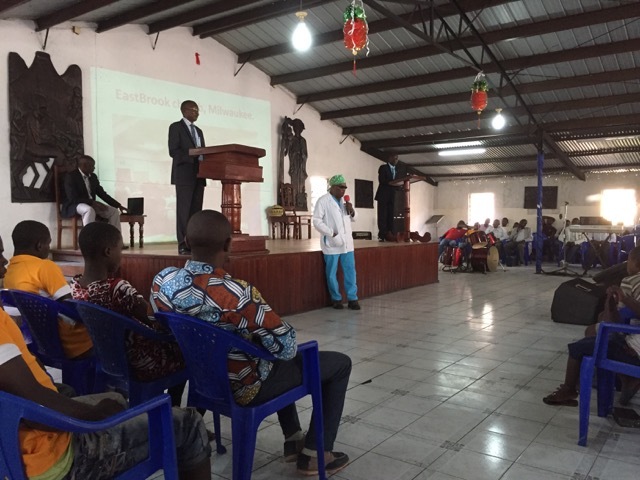 Following the operating session there is a regular Monday afternoon devotional and staff meeting. 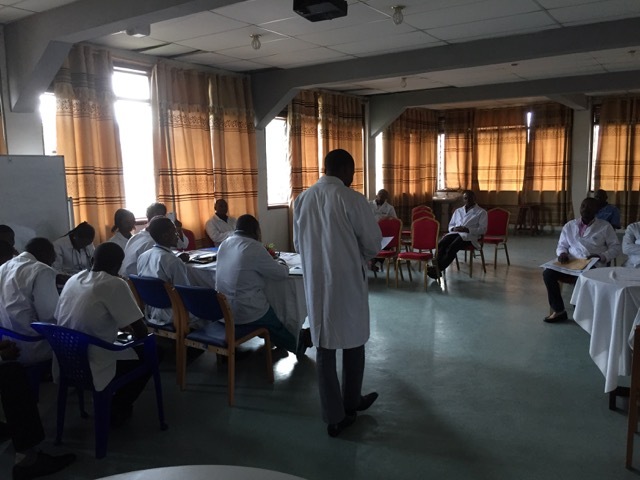 Today Neil, along with HAH (HEAL Africa Hospital) staff, conduct a review of the ‘Mass Casualty Incident’ that occurred last week. Staff contribute well in the discussions. The meeting concludes by 4.30pm. Most staff have to walk home. It is important they travel to their homes before sunset before it becomes less safe. Gwen spends the day farewelling Paul and Shannan Bakes who leave to return home. She then continues on to work in the AusHEAL office on policy and financial issues, often interrupted by members of the hospital family seeking her advice or just wanting to have a chat. This happens most days. Opportunities for informal English upskilling. She is compiling reports for AusHEAL and provides liaison with HAH administration. Neil and Gwen have the benefit of a vehicle and travel home on dusty roads and in traffic that seems to move with no particular observance of traffic rules, even when the police direct them – and so it is always a pleasure (and relief) to arrive home safely. Dinner is at 7pm, some work and then to bed. mornings at 7.30am the hospital staff are required to attend a chapel service at the chapel adjacent to the hospital grounds, so an early start is necessary. This is also where hospital staff announcements are made. Then follows a ward round. There are 2 Congolese staff surgeons at HAH. One supervises a teaching ward round while the other proceeds to Outpatients. Today however there is an emergency operating theatre case sent in by MSF (Médecins Sans Frontières) from an outlying village. 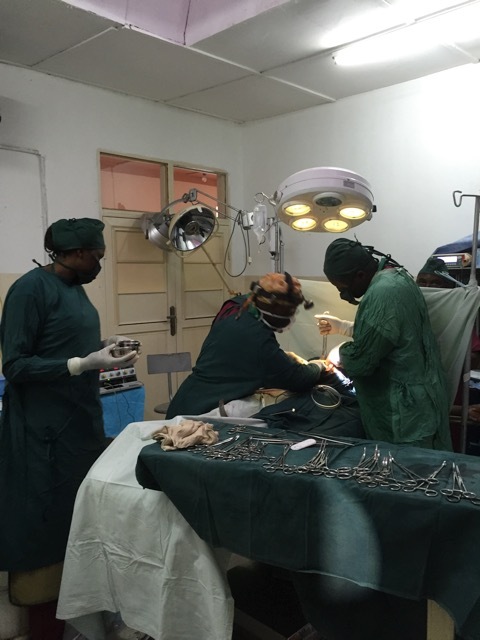 MSF refers surgical cases to HEAL Africa Hospital as its preferred surgical provider. This patient had a laparotomy at the village and was reported to have ‘dead bowel’. MSF was notified and arranged transfer of the patient. At operation, to our surprise the patient’s bowel is mostly fine, only slightly inflamed. We return to the Outpatient clinic, already commenced by one of the residents. Tuesday afternoon is slightly less busy, a time to catch up on paperwork and prepare lectures for teaching. 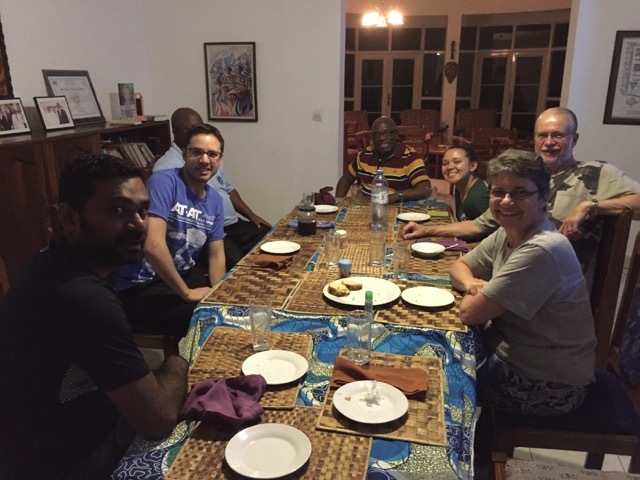 Dr Jo Lusi (HAH Founder) and Dr Justin (Hospital CEO) have arrived back from an advocacy trip to the USA. It is good to greet Dr Jo and receive his brief report on their trip. Morning starts again at 8am with the surgery ‘handover meeting’ followed by a brief ward round. Then theatre cases commence. Today, most cases involve skin grafting patients with major burns. A condition that occurs so frequently in Congo. 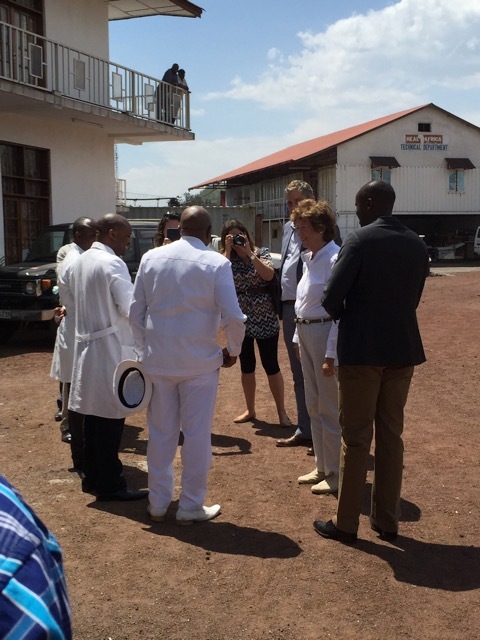 Today is a little different because we break at 1pm as the British Minister of State for Foreign and Commonwealth Affairs is visiting HEAL Africa Hospital to see the work being done through the hospital with victims of sexual violence. Many hospital staff attend, as do Neil and Gwen. The Minister seems very impressed with HAH and leaves about 2pm. Neil returns to the operating theatre. Following surgery an impromptu ward round is conducted after which the bumpy, dusty trip back home to Maji Matulivu begins. Tonight at dinner we are joined by a TEAR Fund worker who has been teaching seminars on ‘Transforming Masculinity’ as part of a response to the Sexual Violence issues in north eastern Congo; a political science researcher from the USA who is assessing how governance occurs in towns which have suffered conflict; Nadia, a US citizen raised in Kinshasa (a longer term volunteer at HAH and guest at Maji); as well as David Lusi (Head of Procurement for HAH projects) and of course Dr Jo Lusi. This makes for very lively discussions regarding aid and development in D.R.Congo and beyond. The surgical team goes straight to theatre after the ward round. A slightly lighter day sees the operating list finish by 3pm. The staff like this as they can set off home in the daylight. They have been working hard in the past weeks. 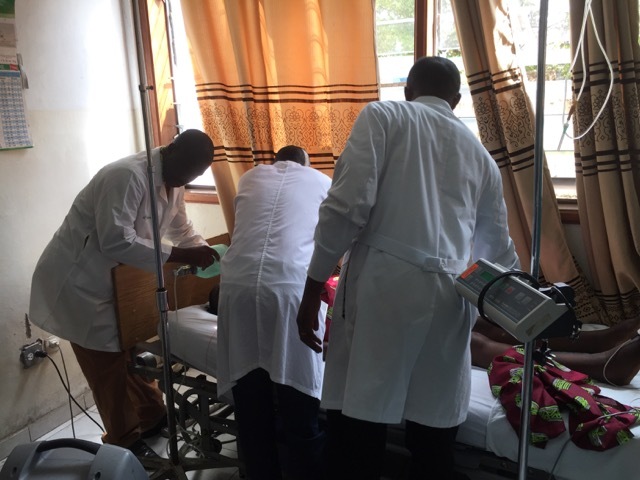 More patients had been scheduled for surgery today but, as regularly occurs, a number of patients have not come to the hospital for their scheduled surgery. They may have had a consultation and agreed to surgery, only to claim they cannot afford the small amount of funds needed to pay for the procedure. The hospital’s HEAL Africa Mercy Fund is only allocated to the genuinely poor who are without any means of paying. Despite an additional outlay of funds this year for needy cases, our AusHEAL Hospital Patient Fund allocation for 2015 has now been mostly exhausted, used for cases treated by recent AusHEAL teams. The other reason patients do not come for surgery is that following the consultation at HAH, they may have consulted their local village elder or their village ‘traditional medicine man’ or relatives who advise (without medical knowledge) that surgery should not occur. Fear may be a factor as well. Morning after chapel, Neil conducts a ward round. Sadly, in Intensive Care a medical patient has a cardiac arrest. Neil is able to assist the physicians with resuscitation. Efforts are unsuccessful. A teaching ward round follows, followed by an Outpatient clinic as the HAH staff surgeon has an emergency case in theatre: a baby who ‘just turned up’ at Outpatients with a strangulated hernia. 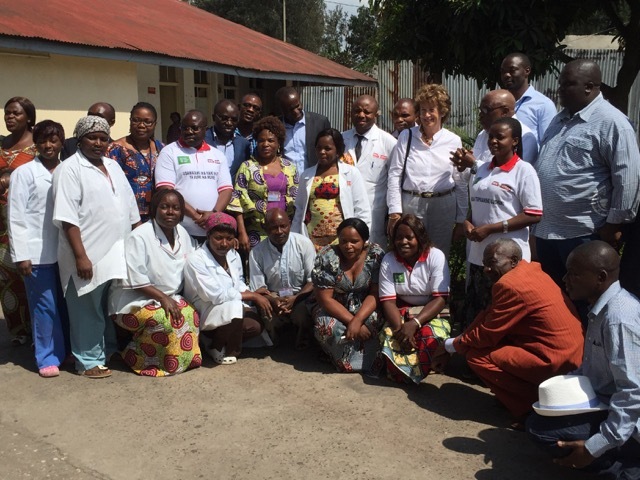 Dr Luc (HAH Director of Surgery) has travelled to an outlying village for a ‘surgical outreach’ to treat patients with cleft lips and palates, using funds provided by a Congolese telecom company. The surgical team remaining at HAH is a little ‘stretched’. After a short lunch break around 1.30pm there is another teaching session in the afternoon on ‘Abdominal Injuries’. It is well attended by both medical students and hospital staff. More lectures to prepare and reports to write after dinner. is a half day working day for medical staff. At 8am Neil meets Dr Medard, the remaining HAH staff surgeon. Together they conduct a ward round of Intensive Care patients. The ‘handover meeting’ occurs but today it is a little different. The Interns based at HAH for the past 10 months are leaving. They provide food and drink for the staff and a representative makes a speech of thanks to hospital staff. 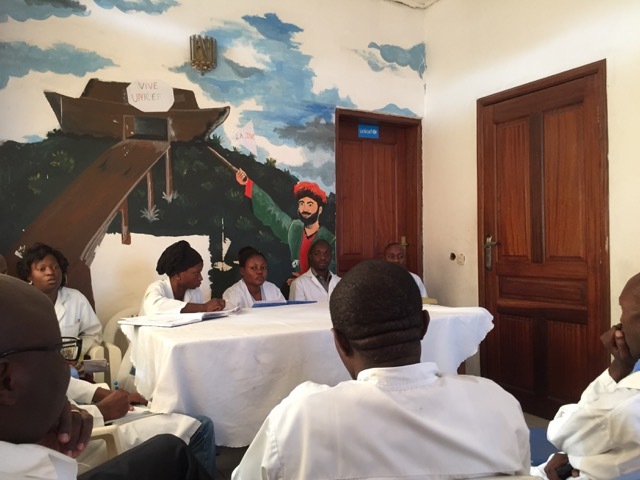 ‘Interns’ in Congo are medical students in their final of 7 years of university. They are unpaid but work as doctors with some supervision. A ward round of non-ICU patients follows and then Neil is involved in the oral viva exams for the surgical interns. The exams take 3½ hours for 5 students. All quite tiring. It reveals a great need for improved education as these interns will be fully qualified soon and, should they get a job they may well work in a peripheral provincial medical centre and be expected to perform surgery and treat complex medical issues. It underlines the ongoing role AusHEAL has to play in supporting HEAL Africa Hospital with medical education. 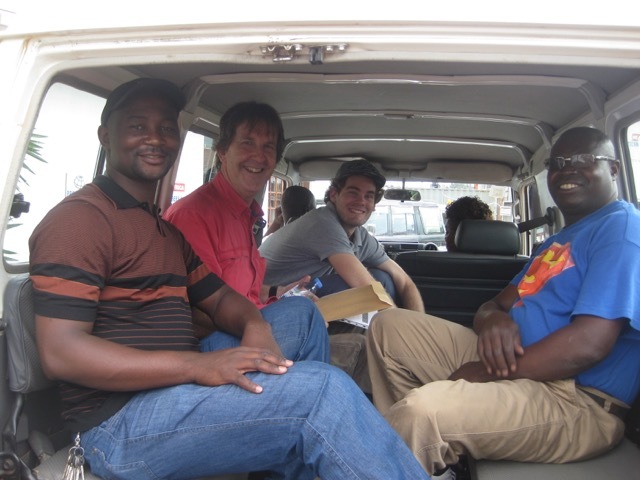 Finally the trip back to Maji at 4pm, buying supplies on the trip home, and then writing the blog. Yet more reports remain to be written! Hopefully, rest tomorrow!